After all the travelling and vacations this summer, finally I am getting back to my studio to paint and spend more hours. Here I take the challenge of daily painting. Ever since I came from Cuba I have been painting the cars in my mind. Cuba apart from known for its Cigars and white sands it is known for it colourful classic cars. I got to take tons of pictures that I can use for reference for my paintings and form great memories. 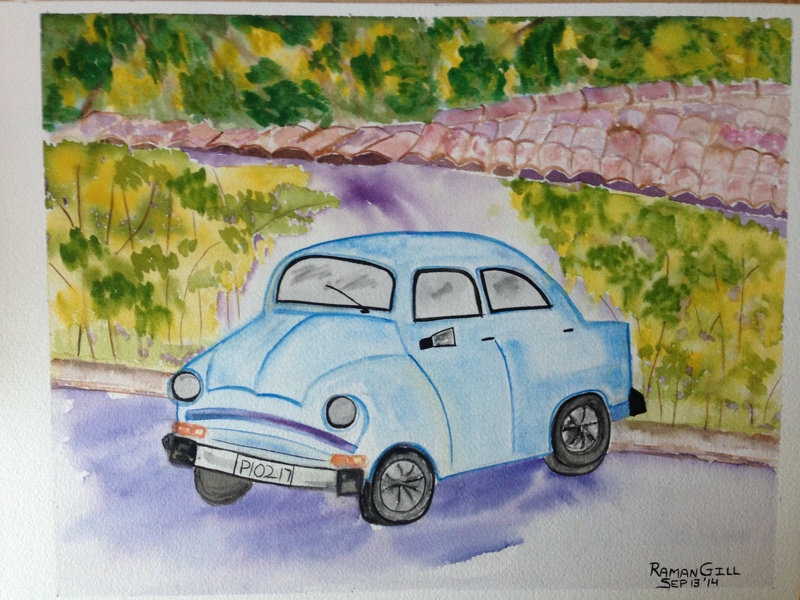 Today I painted a classic car that I believe to be from early 1950’s or much before. A very attractive small four door car stood outside the Celicia restaurant in Havana. The car had a perfect backdrop of plants and wall of the restaurant with thatched roofs. I am glad I painted using high quality material -it is painted on Arches watercolour paper (100% cotton) and Winsor and Newton watercolours. Size- 11×14 inch.